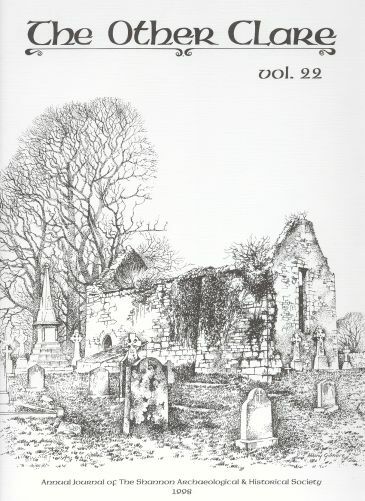 The Clooney Graveyard was featured on the cover of The Other Clare, the “Annual Journal of the Shannon Archaeological & Historical Society” in 1998. This beautiful illustration of the graveyard was drawn by Hillary Gilmore. In this issue of the magazine is an article about monuments in the graveyard, particularly the monument erected to the memory of Denis O’Duffy of Maghera. This particular issue also features an article on local “tower houses” which provides information about Clooney Castle, a ruin located near the graveyard. 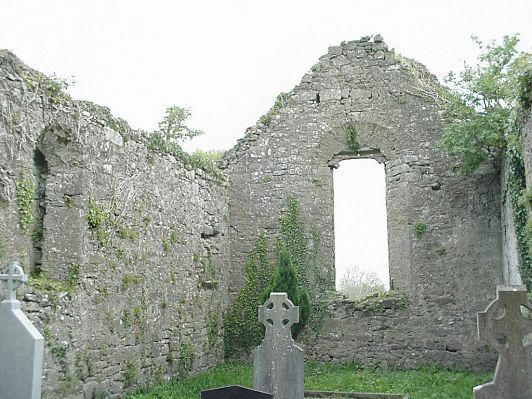 This photograph shows the interior of the old church in the Clooney Graveyard. There are graves located inside the church, which is not uncommon at old religious sites in Ireland. The Clooney church is mentioned in the letters of John O’Donovan and Eugene Curry, legendary scholars who traversed County Clare and collected information on “antiquities” for the British Ordnance Survey in 1839. The large window (which O’Donovan and Curry duly described as “nine feet in height and four feet in width”) faces to the east. Sunlight would come through the window during morning mass. These are the ruins of Clooney Castle, as seen from the graveyard. The castle was a small tower house, built of limestone. Much of it has collapsed, and the ruins are almost entirely covered with ivy. 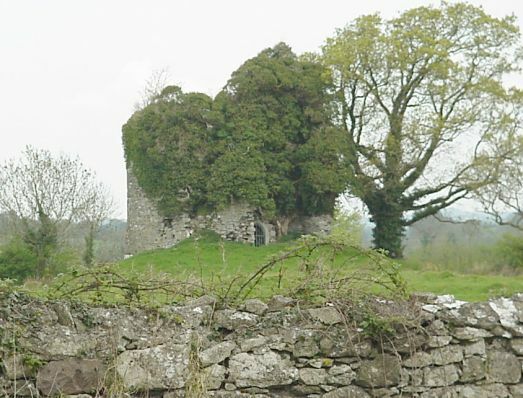 The date of the construction of the Clooney Castle is not known, but it was recorded as the property of a knight of the O’Grady family in the 1500s. 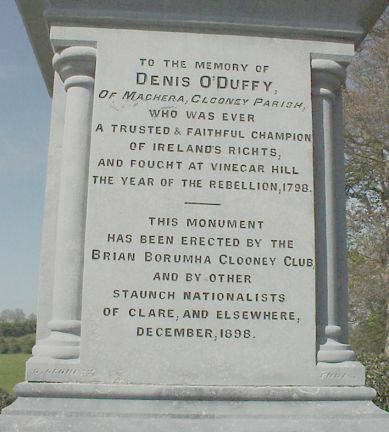 This is the inscription on the side of the monument for Denis O’Duffy in the Clooney graveyard. O’Duffy is believed to have lived on a farm close to the land occupied by my ancestors, the Nestor family. He was known as an expert horseman, and when he heard of the uprising in Wexford he rode there to join the rebels. After the bloody defeat at Vinegar Hill, O’Duffy returned to Maghera, but soon learned that he was wanted by the English. He fled to France, where he joined the army of Napoleon. He was eventually killed in action while fighting the English on the continent. The Irish nationalists who erected this monument in 1898 were themselves making a bold political statement.